When we come home after a long day at work, we want to feel like we can truly relax and unwind. In each home, we should all have one sacred space – a place we can run to when life seems like too much to handle. Our space should make us feel welcomed and comforted, like we can totally unravel ourselves and shake away all the stresses of the day behind us. It should feel like our ultimate sanctuary, and reflect our true selves. However, many people don’t spend time creating this space within their houses, so it just feels like a pit stop before the next day at work. 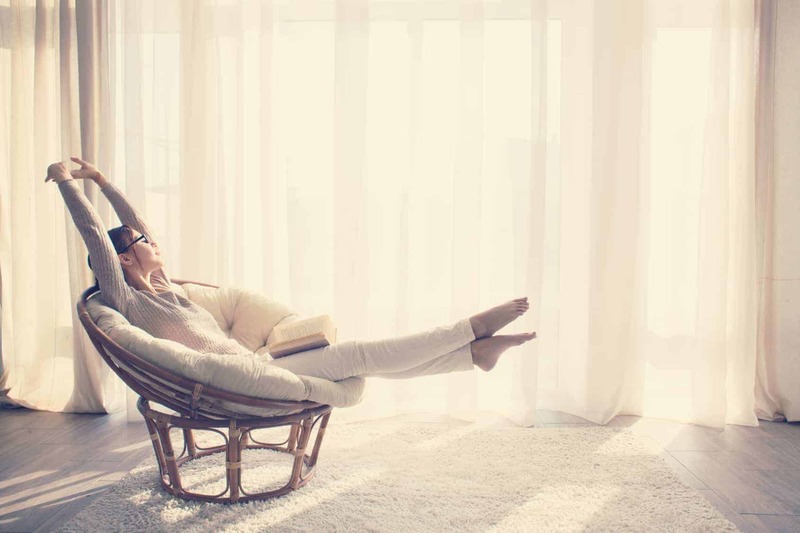 If you want to make your house feel like a home, a place where you can relax and connect more to your inner self, read our tips below to get started. 1. Buy plants to put around your home. Not only will bringing nature into your home help you relax, but house plants have other health benefits as well. A multitude of studies have shown that they can fight pollution, ward off allergies and colds, boost your mood, and even help your concentration and cognitive function. If you truly want to cultivate a sacred space, adding plants to your home will help you achieve this goal, plus, they add a nice touch of natural color to the space. 2. Keep your house clean and organized. A sacred space can’t exist without cleanliness and organization; after all, a cluttered space will only make your mind feel more cluttered, too. Try to make your bed each day, and keep up other household chores regularly. Not only will this help you combat laziness, but it also makes you more productive and mindful of your space. A messy home only reflects the messes inside of ourselves, so keeping things tidy will help you keep your mind clear and balanced. 3. Turn off your electronic devices a few hours before bed. Multiple studies have proven how electronic devices can hinder sleep if you use them right before bed. The bright light from phone and tablet screens actually signals to our brains to wake up, and suppresses melatonin levels in our brains. This means it will take much longer to actually fall asleep than we may have intended, resulting in feeling very tired the next day for work or school. Not to mention, using your phone or tablet for hours on end poses other health ramifications, including back and neck problems, anxiety, depression, and dangerous exposure to electromagnetic radiation. Being on electronic devices for too many hours a day can simply make us feel frazzled and disconnected, so make sure to turn off your electronics a few hours before bed, and pick up a good ol’ book instead. Also remember, you will create a much more sacred environment by tuning more into yourself than into the virtual world on your phone. 4. Create an altar with items that make you feel more connected to yourself. Everyone connects to themselves and the universe differently, so use whatever feels right for you. Whether you feel more spiritually connected using candles, incense, crystals, or a Buddha sculpture, just make the space representative of what speaks to your soul the most. You can place the altar anywhere in your home, but make sure you choose a quiet, secluded place so you can focus on connecting with your higher self. 5. Light candles or burn your favorite incense. Aromatherapy can help a variety of conditions, from anxiety to insomnia to physical pain. You can include candles and incense as part of your altar, or just have them separate somewhere in your room. Relaxing smells can help you feel more peaceful mentally, emotionally, and physically, and just the sight of burning candles can bring a sense of calmness to you. If you don’t want to burn candles or light incense, you can use a diffuser instead, which will give you all the benefits of the fragrances without the carcinogens. 6. Play relaxing music when you get home from work. A surefire way to create a more mindful environment is by playing calming music throughout your home. Relaxing is relative, so just choose whatever sends you into a state of pure bliss. This will help you to slow down your thoughts, and find the sanctuary within your mind. Music can certainly heal, so find whatever resonates with your soul, and allow the sounds to permeate your home and remove any negative energy. 7. Allow plenty of sunlight into your home. Humans need sunlight to survive – it gives us Vitamin D, boosts our mood, keeps us warm, and so much more. Many people don’t get near enough sun exposure, and of course getting it directly is best, but simply opening the blinds to allow more light in can do wonders for the energy inside your home. The sun gives us life, so naturally, you’ll feel more alive by allowing more natural light inside. 8. Paint your walls calming colors. Try light blue, cream, light gray, pale yellow, deep red, or a soft yellow-green. In general, the colors in nature work best to create a relaxing, sacred space in the home, so you can never go wrong with choosing earthy colors for your wall color. 9. Set aside a space for yoga or meditation. Yoga and meditation have countless health benefits, so doing some sort of exercise that promotes both inner and outer wellness can raise both your energy as well as the energy of the space you occupy. Choose a space that has enough room for you to move comfortably, but also, make sure you can get enough quiet time here so that you can fully immerse yourself in the practice.